How do CEOs in Côte d’Ivoire perceive moves to boost regional cooperation? The return of political stability in 2011 and the sustained growth that ensued have brought Côte d’Ivoire back into the economic and business spotlight in recent years. Average annual GDP growth of around 9% between 2011 and 2016 placed the country as one of the best performing economies globally. On a regional scale, Côte d’Ivoire has re-emerged as a strong advocate of economic and trade integration in West Africa. A key player in ECOWAS and UEMOA, the country has placed great emphasis on rebuilding and extending region-wide infrastructure networks, notably in the transport, power and telecoms sectors. Examples include the Trans-African Highway, which comprises nine highways across the continent, with construction on the 1008-km Abidjan-Lagos leg scheduled to begin in 2019. Furthermore, initiatives such as the West African Power Transmission Corridor and the West African Power Pool are serving to deepen links for the integration of the region’s electricity markets. As for telecoms, progress has been achieved in developing the region’s connectivity, notably by strengthening infrastructure links between Côte d’Ivoire and neighbouring states such as Guinea and Liberia. Ultimately serving to deepen integration and unlock opportunities for trade and investment, such aspirations are undoubtedly what has the business community upbeat about the African Continental Free Trade Agreement (AfCFTA), with 68% of the 100 respondents in Oxford Business Group’s latest Business Barometer: Côte d’Ivoire CEO survey, published in 2019, saying the deal will have a positive or very positive impact on regional trade levels. Signed in early 2018, the AfCFTA aims to consolidate the continent’s commercial ties and boost trade volumes by 50% over the next five years. The agreement has also served to highlight some common and lingering challenges that have long stood in the way of the continent’s economic prosperity, such as poor infrastructure and transportation networks, and heavy bureaucracy. In that regard, Côte d’Ivoire is perhaps one of the countries that has made significant strides in addressing some of these bottlenecks. Since 2011 major investments have been channelled into rehabilitating and expanding infrastructure, most notably of roads, ports, telecoms and energy. Policy reforms have also been instituted, including fiscal changes throughout 2018 to simplify and enhance tax collection, while a major e-government project has been launched to streamline bureaucracy and eliminate red tape. In the 2019 edition of its “Doing Business” report, the World Bank ranked Côte d’Ivoire among the top- 10 improvers in 2018 in terms of reforms carried out. However, important challenges must be addressed before the potential of all these endeavours materialise. 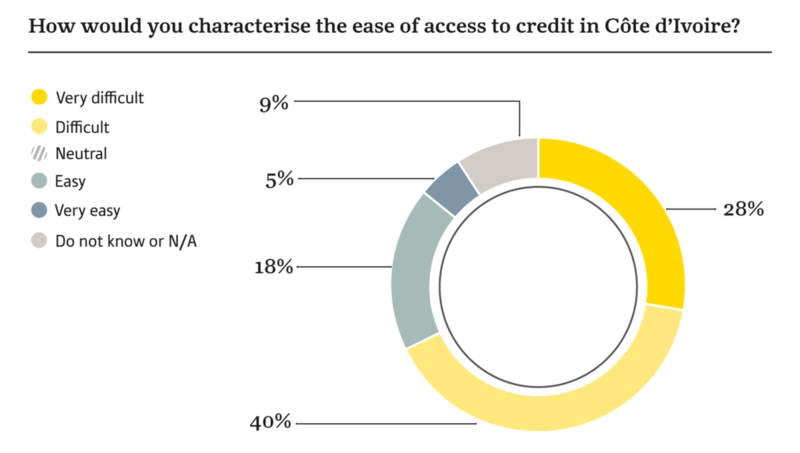 Among those identified in our survey are taxation and access to credit, with results largely unchanged from the previous CEO survey published in 2018: 59% of respondents deem the country’s current tax environment on a global scale as uncompetitive or very uncompetitive, while 68% say access to credit was difficult or very difficult. 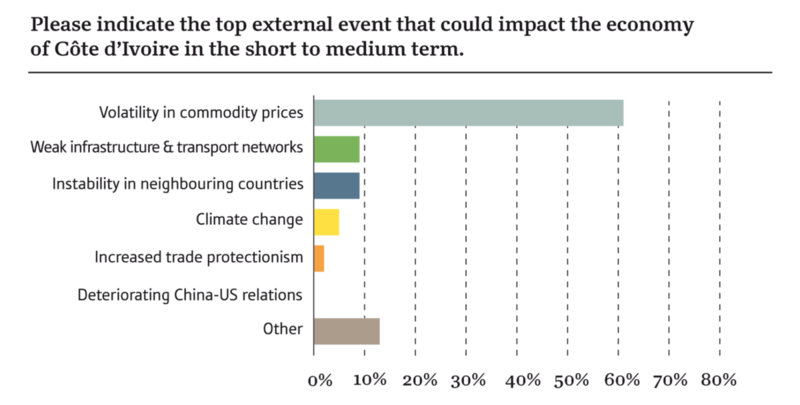 Furthermore, 61% of participants identify volatility in commodity prices as the top external factor that could impact the economy in the short to medium term. This result is clearly demonstrated in the economic slowdown of recent years, when GDP growth fell from 8% in 2016 to 7.7% in 2017. While policies targeting economic diversification are well under way, immediate-term growth remains contingent on returns from the agriculture sector, which accounted for 17.6% of GDP in 2017, and more particularly, its top foreign revenue provider, cocoa, as well as other leading exports, such cashew nuts and cotton. Cocoa has traditionally accounted for around one-third of Côte d’Ivoire export earnings. Despite the drop in prices starting from mid-2016, a record production in the 2016/17 season of over 2m tonnes of beans helped offset the anticipated decline in revenues. The trend, however, has since decelerated as prices continued to drop, weighing on the country’s overall trade balance in 2018. The government has made it a priority under its national economic agenda, the 2016-20 National Development Plan, to boost local processing capacities and build value addition, with the ambition of transforming local cocoa output to 50% by the end of the period. This lines up with Côte d’Ivoire’s aim to raise the industrial sector’s contribution to GDP from 25% in 2016 to 40% by 2020. With these projections in mind, the country’s mid-term prospects appear promising. According to our findings, 33% of the C-Suite executives surveyed expect agriculture to remain the main economic driver of growth by 2025, followed by industry (30%) and ICT and telecoms (15%). Immediate-term expectations also seem robust, despite the anticipated economic slowdown in the build-up to the 2020 presidential elections, with 85% of participants saying they are likely or very likely to make a significant capital investment in 2019, compared to 82% in our last survey. According to the IMF, GDP was projected to grow by 7.4% in 2018 and 7.5% in 2019.